Published: Feb. 15, 2013 at 07:49 p.m. 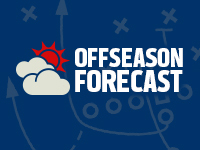 Updated: Feb. 16, 2013 at 07:42 p.m.
With the offseason officially underway, Around the League will examine what's next for all 32 teams. The series continues with the Philadelphia Eagles. 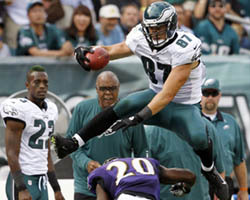 Take a look at some of the best images from the 2012 Philadelphia Eagles season. Andy Reid was the longest-tenured head coach in the NFL and winningest coach in Eagles history. He's been replaced by former-Oregon coach Chip Kelly, renowned for his outside-the-box creativity and up-tempo spread offense. Kelly quickly turned to ex-Cleveland Browns coach Pat Shurmur as offensive coordinator, replacing Marty Mornhinweg. Former Arizona Cardinals and San Francisco 49ers coordinator Billy Davis will be charged with turning around a defense that imploded under Todd Bowles and "wide-9" specialist Jim Washburn in the second half of the 2012 season. » CB Dominique Rodgers-Cromartie: Rodgers-Cromartie started the season severely outplaying Nnamdi Asomugha as the Eagles' top cover cornerback, but fell apart with the rest of the secondary after Juan Castillo was fired as defensive coordinator in October. DRC does possess the youth, size and athleticism to draw a contract offer that will likely be too rich for the Eagles. » OT King Dunlap: Dunlap held his own when pressed into service last season, but he won't be viewed as a starter with left tackle Jason Peterson due back from Achilles surgery and Todd Herremans holding down right tackle. » DT Derek Landri: While Landri does provide a disruptive interior pass-rushing presence, he proved too soft against the run in a disappointing 2012 season. With a new defensive system in place, he's unlikely to be brought back. The secondary will require an overhaul as opposed to a band-aid after surrendering big plays at an alarming rate down the stretch. The Eagles could have new starters at all four secondary positions next season. Davis will be on the lookout for a run-plugging nose tackle as the defense transitions to a 3-4 scheme. Although Michael Vick was brought back under an adjusted contract, Kelly will be under pressure to find his quarterback of the future. Highly regarded new vice president of player personnel Tom Gamble will be a busy man in March. The Eagles will field offers for quarterback Nick Foles, with a trade to the Kansas City Chiefs as a likely scenario. Cornerback Nnamdi Asomugha is expected to be a cap casualty after a disastrous two-year stint in Philadelphia. Gamble and Kelly could use the No. 4 overall pick on Utah's Star Lotulelei to fill the nose-tackle void while targeting a developmental quarterback in the second or third round.